Most of our driving was on the service roads paralleling Interstate 40. 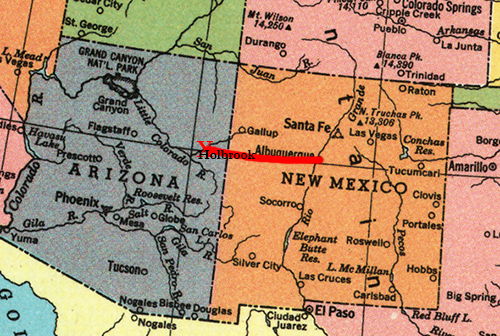 Kyle and I knew where we were landing today—Holbrook, Arizona, home to the Wigwam Motel, one of only 7 Wigwam Villages in the United States. Holbrook’s teepees are known as #6. We made a few turn-offs into Indian souvenir stands, but I was more in a hurry to get to the motel than spend our time on the road, and Kyle just wanted to get the hell off the road.